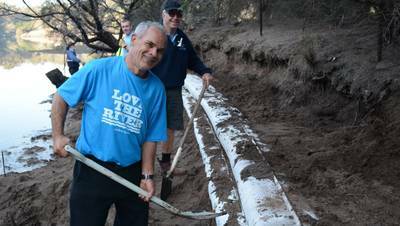 Riverwatch undertakes Bank Restoration work on the Yowaka River. 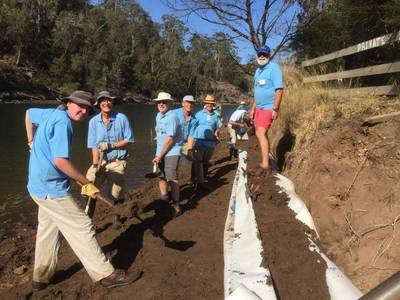 With shovels in hand, Sapphire Coast Wilderness Oysters (SCWO) farmers and Shoalhaven Riverwatch took to the banks of the Yowaka River on May 8-9 for a two-day “sand sausage” working bee to combat erosion. 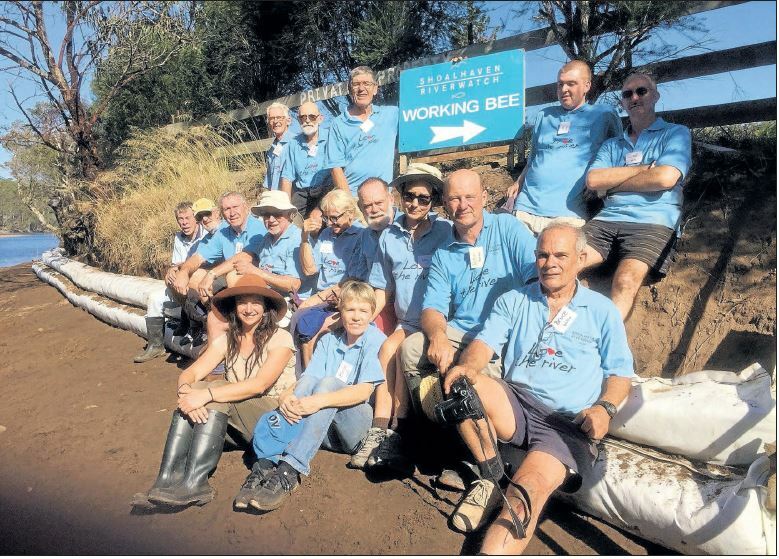 ​See the SCR press articles. 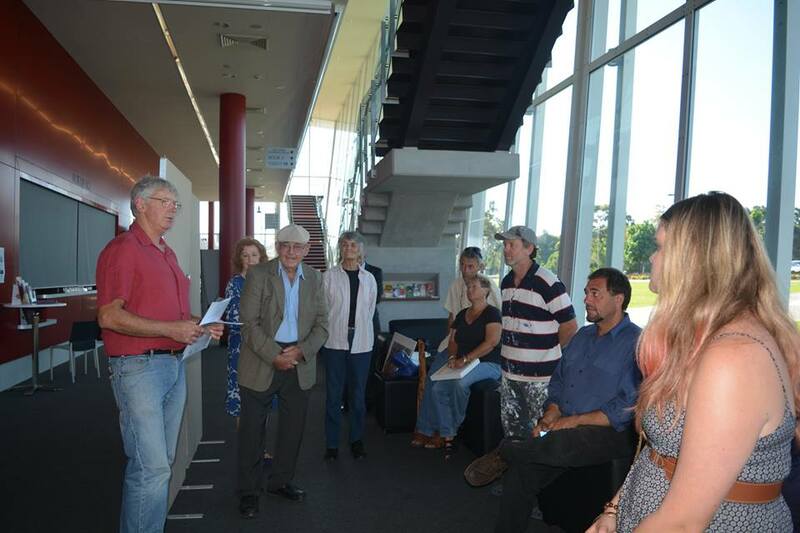 See the Magnet News article. Shoalhaven Riverwatch was again delighted to host students from Shoalhaven High School to view our bank restoration work at the Nowra Golf Club. 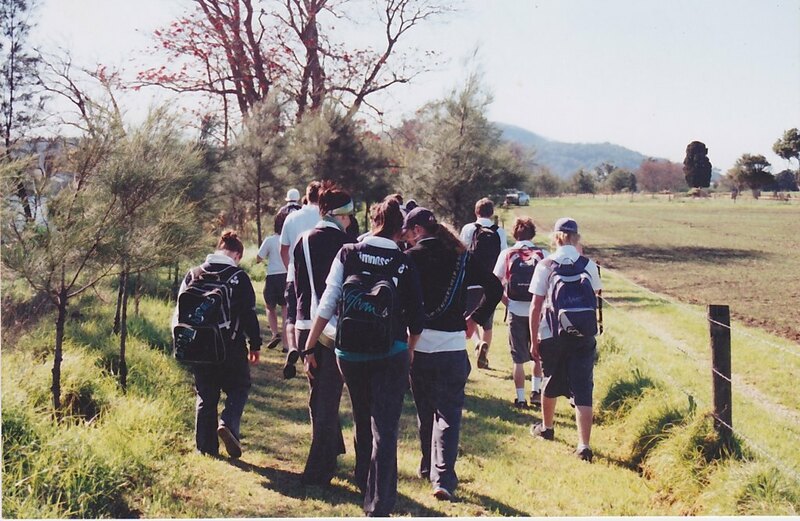 The excursion is part of the High School Certificate (HSC) Earth and Environmental Science subject, which is the study of the planet Earth, its processes and its environment. 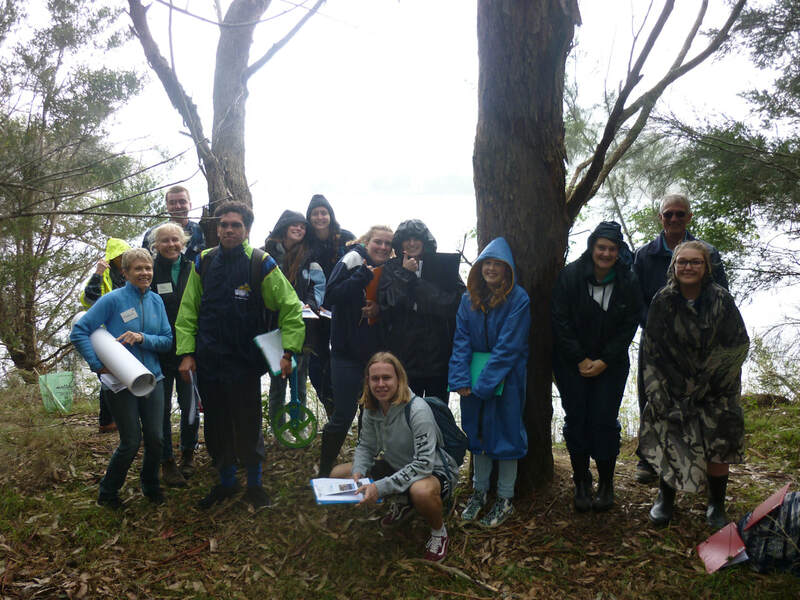 ​In late September 2017, the New Ways Forward – Youth Bushcare and Landcare Forum was held at the historic and picturesque Riversdale on the Shoalhaven River. 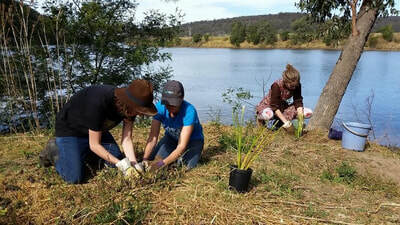 New Ways Forward was targeted at young people in the community who are passionate about the environment and interested in creating change. 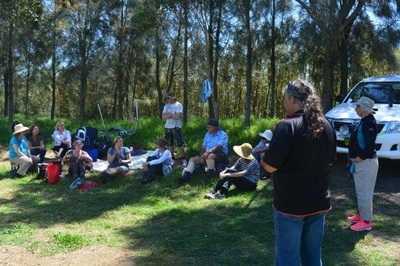 The forum was supported by Shoalhaven Landcare and Shoalhaven Bushcare and facilitated by Intrepid Landcare co-founder, and internationally recognised change-maker, Megan Rowlatt. 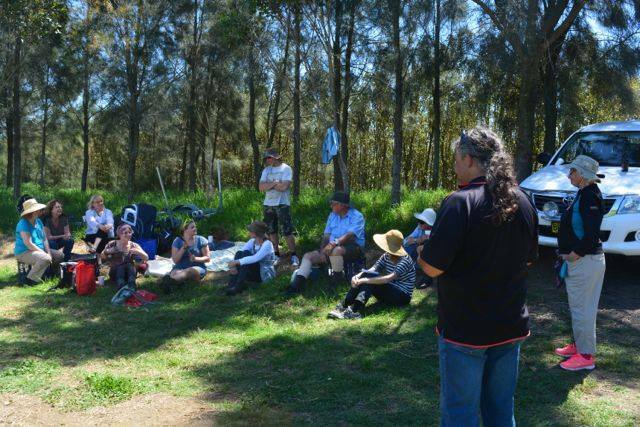 The day began with a workshop led by Megan, designed to inspire, engage and help the participants to develop leadership and planning skills and to define and create opportunities for environmental and social change. 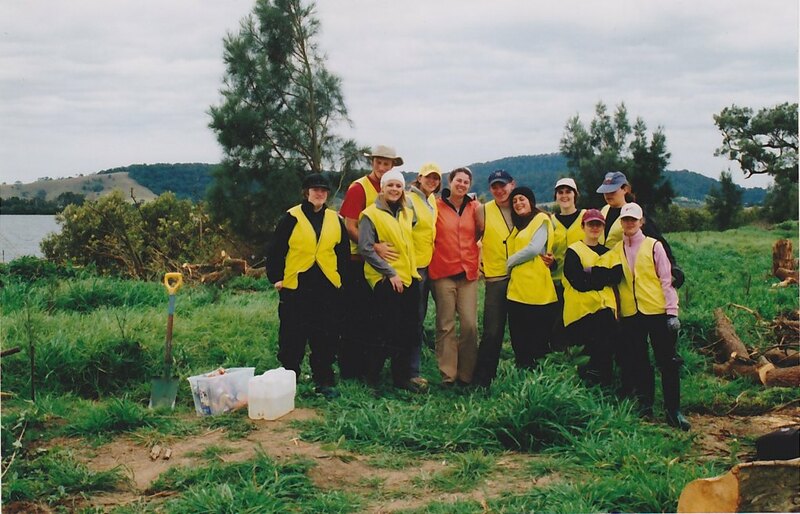 Megan’s success stories of amazing initiatives achieved by groups of young people around Australia and abroad are truly inspiring, and the planning process she teaches provides a practical and effective method for exploring and developing projects. 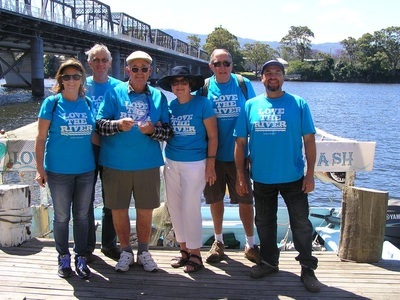 The afternoon was spent on the Shoalhaven River with Riverwatch volunteers who demonstrated the proven methods Riverwatch has used to restore and protect the Shoalhaven River. 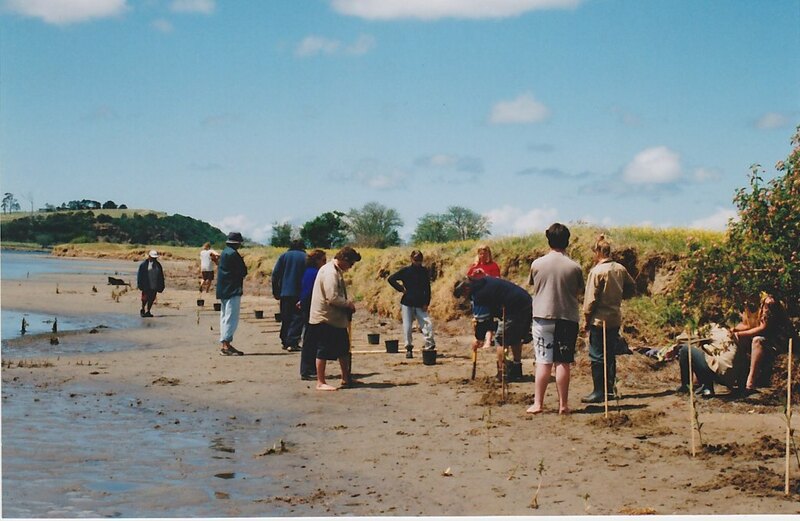 A barbeque lunch was enjoyed, and some planting undertaken to help stabilise the river bank. Thanks to Megan, Riverwatch, Riversdale, Shoalhaven Landcare and all the participants, for making the day a success. 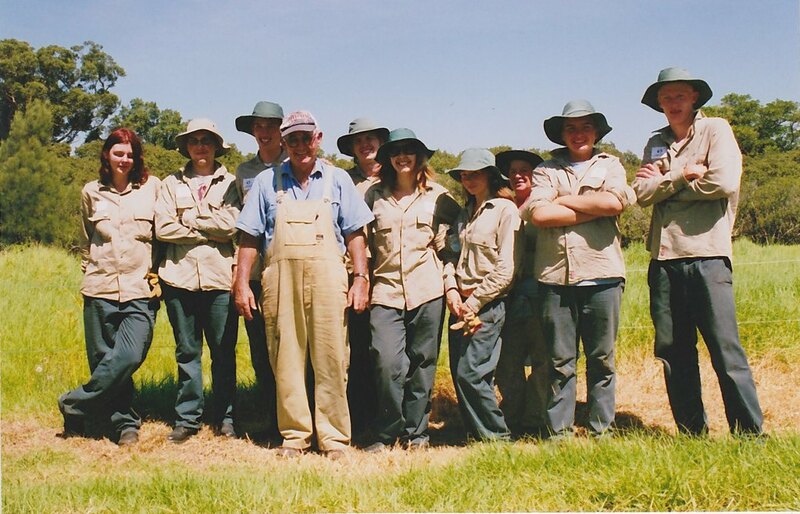 Shoalhaven Landcare and Shoalhaven Bushcare will work together to further develop the Youth Bushcare and Landcare Forum. 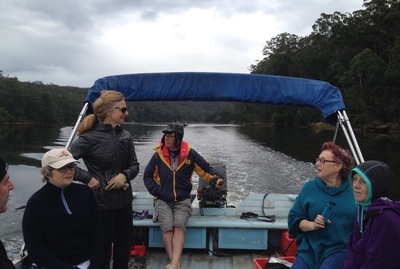 On Saturday 28 May 2016 Riverwatch provided an opportunity for the Bundanon Trust to view the properties of Riversdale and Bundanon from the Shoalhaven River in the comfort of the Riverwatch punt. 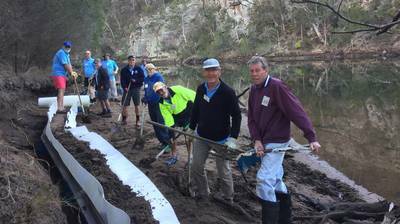 Ron and Keith from Riverwatch provided information on various aspect of the river including recent bank restoration work at Bamarang. 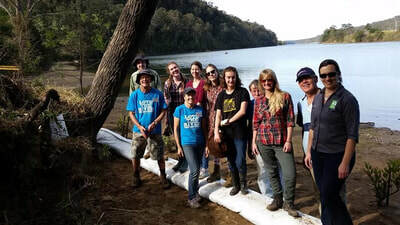 Riverwatch is keen to continue to develop a partnership with Bundanon and provide advice on bank restoration work. 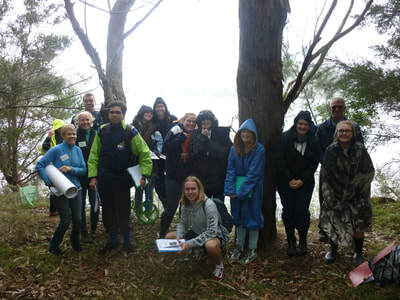 On 12 September 2016 Shoalhaven Riverwatch hosted Year 5 students from Illaroo Public School on a riverbank restoration excursion. 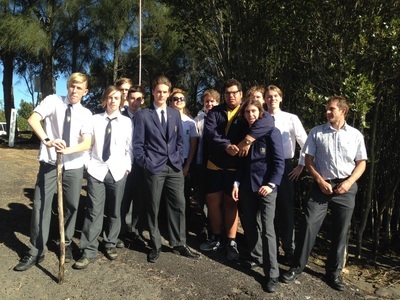 A presentation was given to the students at the school followed by a walk through the Grotto, ending up at the riverbank at the Golf Club. 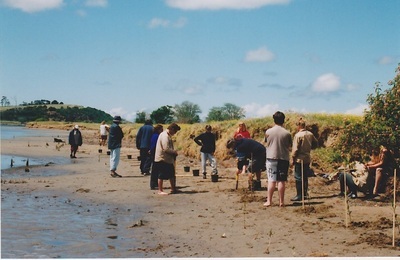 The group of students were broken into three groups and shown examples of bank restoration work undertaken by Riverwatch volunteers. 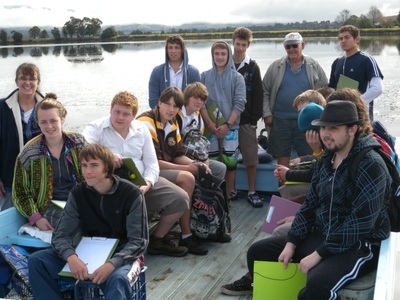 The excursion was to assist the students as part of their geography studies on the Shoalhaven River. 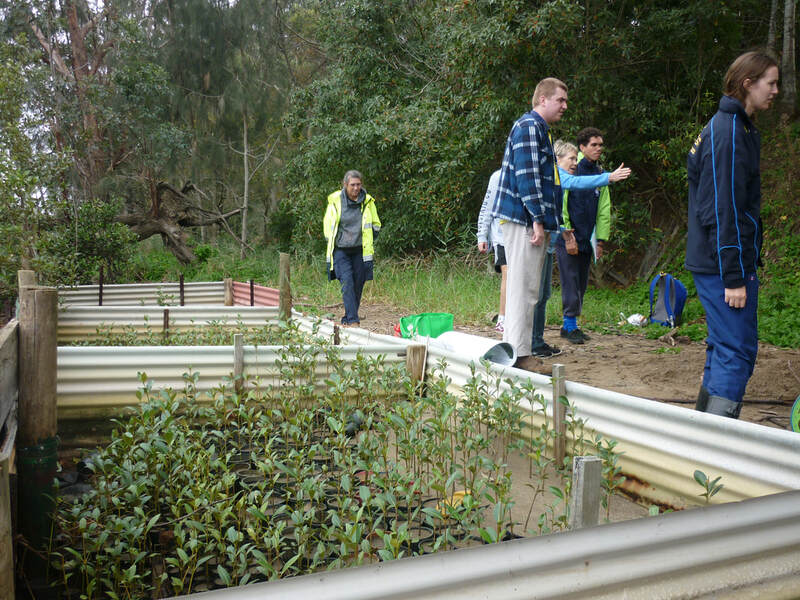 For many of the students this was the first time they had been given first-hand information on a local initiative to undertake riverbank restoration work. 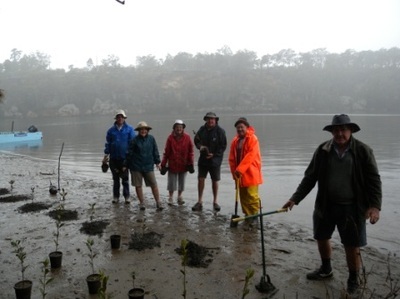 Riverwatch volunteers together with volunteers from the Nowra Golf Club Veterans Bushcare group gave talks on different bank restoration techniques and the importance of restoring vegetation on river foreshores. Today's walk was very exciting, learning about mangroves and erosion can be interesting. On today's walk I got to have lots of fun with my dad and I also I got to know a lots about mangroves thank you for taking us. Today's walk was fun, I enjoyed walking there and back. 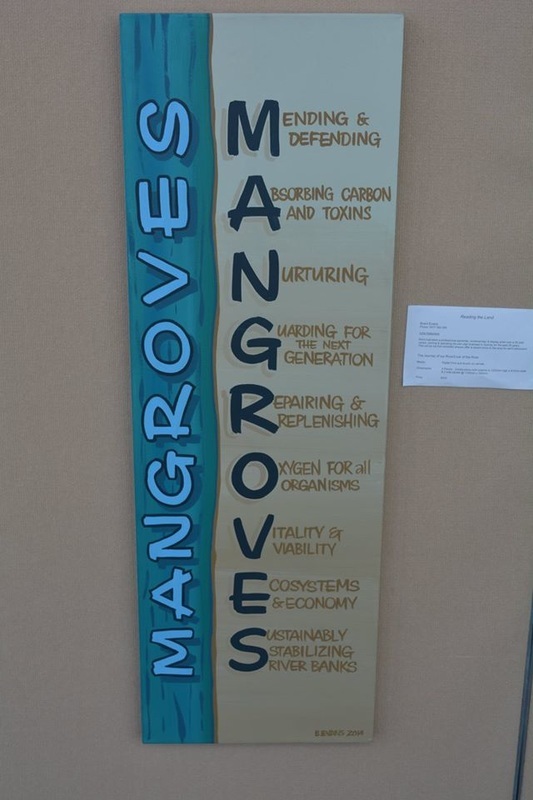 I also enjoyed learning all about the mangroves and sand sausage. Thank you teachers for taking us and all the volunteers. 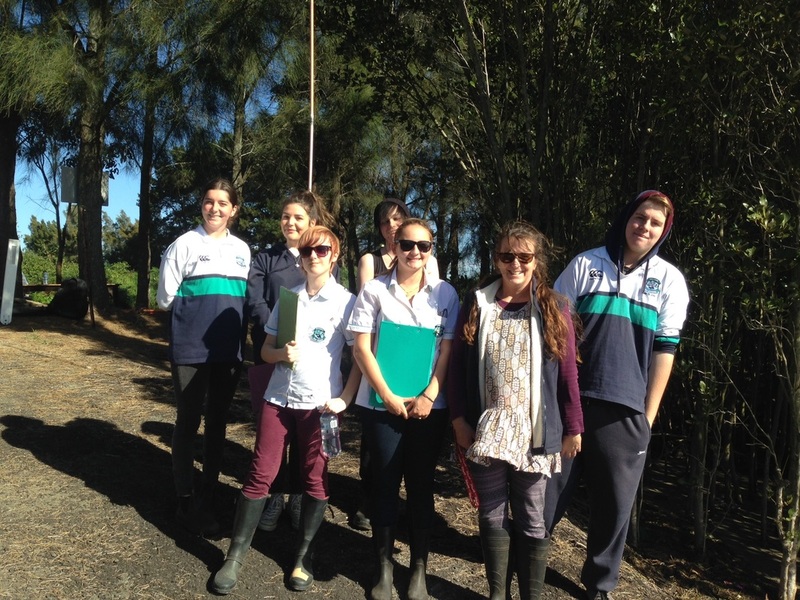 Today's walk was exciting, we learnt about what mangroves are planted for. 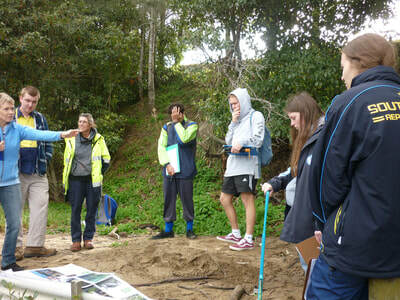 We also learnt about erosion and the Sand Sausage. Riverwatch is always keen to have our younger generation involved in improving the health of our wonderful Shoalhaven River. 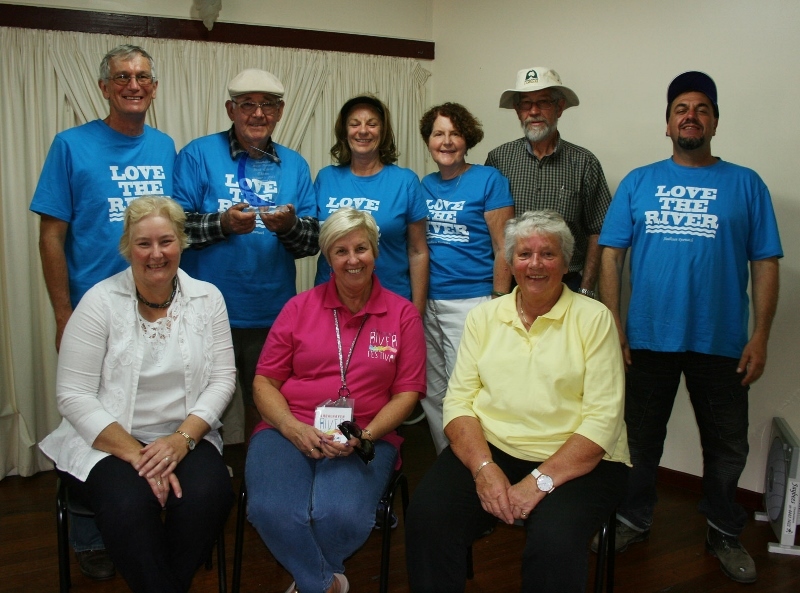 New volunteers are always welcomed. On 19 May 2016 Shoalhaven Riverwatch hosted two groups of 24 students from St John’s High School and Shoalhaven High School on a riverbank restoration excursion. The river excursion consisted of a tour to the foreshores of the Shoalhaven River at Numbaa to show examples of bank restoration work undertaken by Riverwatch volunteers. 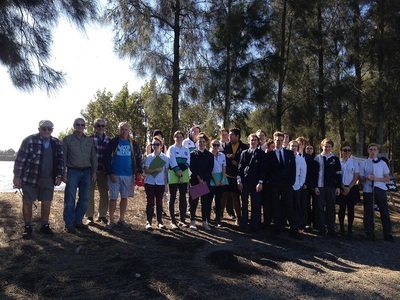 The excursion was to assist the students in completing an assignment on bank erosion and restoration work as part of their HSC Earth and Environmental Science subject. For many of the students this was the first time they had been given first-hand information on a local initiative to undertake riverbank restoration work. 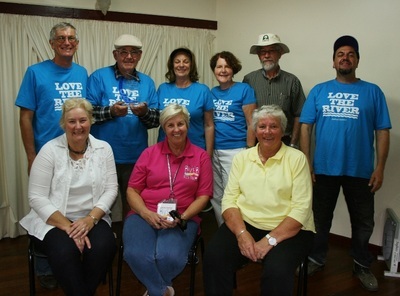 Riverwatch volunteers gave talks on different bank restoration techniques and the importance of restoring vegetation on river foreshores. 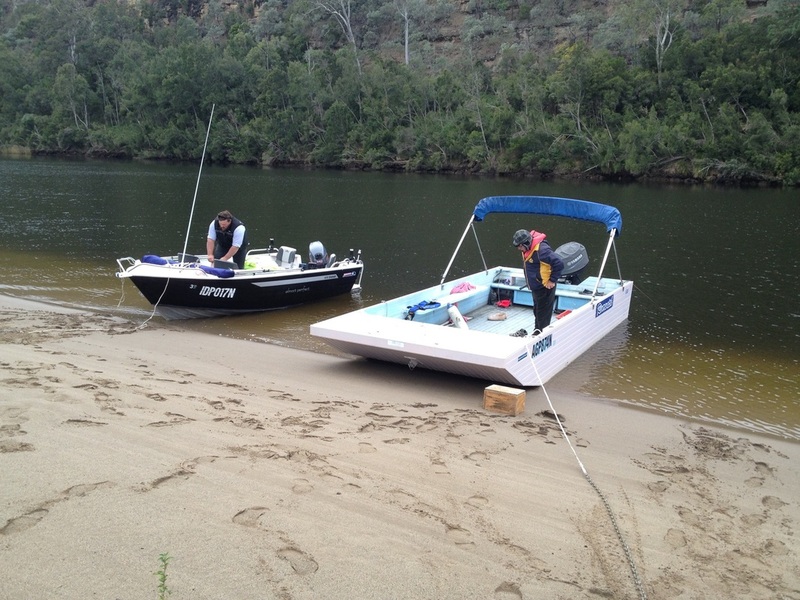 Unfortunately due to bad weather, a river tour to Numbaa Island to view the latest river restoration techniques was not possible. 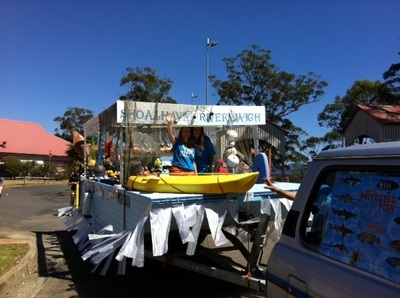 Shoalhaven Riverwatch has been a ﻿strong ﻿supporter of Reading the Land. 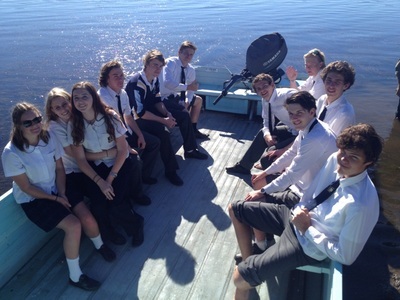 (RtL). 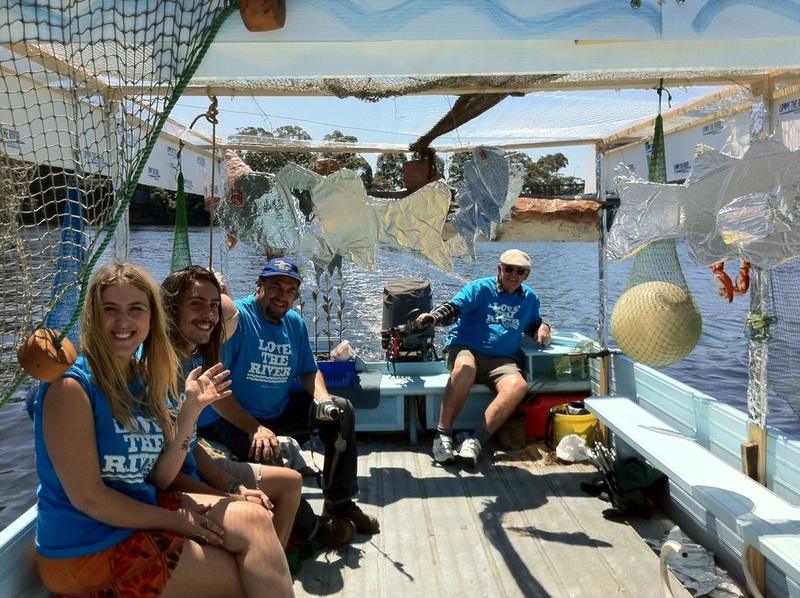 Riverwatch has assisted with providing Riverwatch volunteers and the use of our Riverwatch boat for artists to explore our wonderful Shoalhaven river for artistic inspiration. 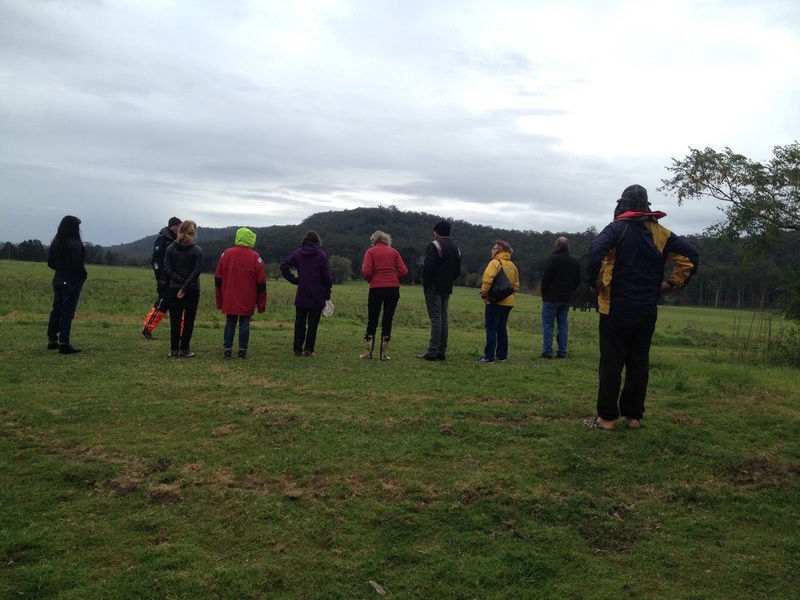 On Saturday 11th October 2014, 17 artists participated in Reading the Land @ Shoalhaven River. 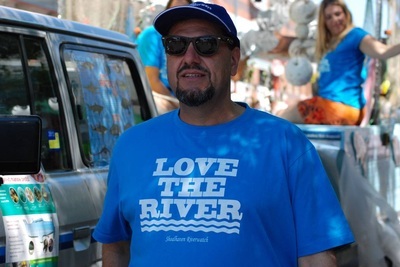 Inspired by the river and the work and passion of Charlie Weir and Riverwatch volunteers, these artists exhibited their works during the 2014 Shoalhaven River Festival. Shoalhaven Landcare also assisted with funding the event and displaying the artwork in the Landcare marquee during the festival. In February 2015, Shoalhaven Council and Arts Centre hosted 6 young people in an exploration of the local environment with a view to creating art. Riverwatch assisted the group by providing volunteers to take the young artists on a boat trip for inspiration. 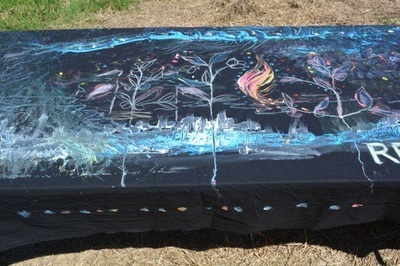 The artists looked at urban environments, bush and the river. Their environmental art project "It Starts with Us – Our Place, Our Vision," was on exhibition at Shoalhaven Arts Centre during April 2015. 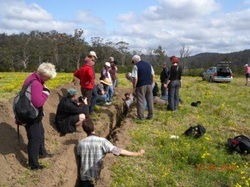 For additional information on being involved with future opportunities please visit Reading of The Land Facebook Page. Shoalhaven Landcare and Shoalhaven Riverwatch are actively involved in the yearly Shoalhaven River Festivals. More photos and information is available on the following South Coast Register's websites. Highlights of the first Shoalhaven River Festival held in 2013. 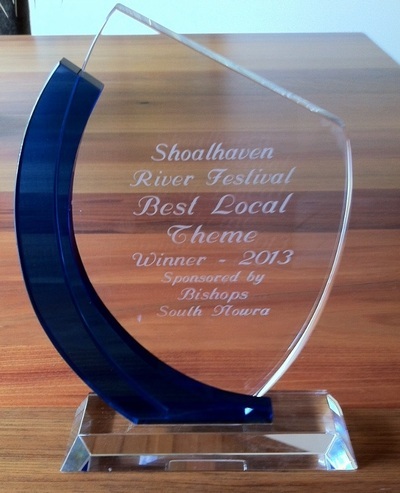 The Riverwatch Boat took out the trophy for the Best Local Theme. 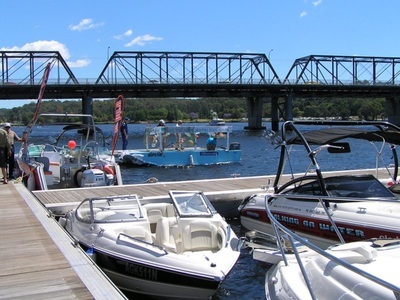 Among the wake boarding boats. Riverwatch is a member of Shoalhaven Landcare Association. 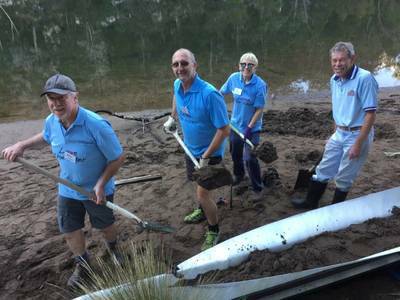 There is always a cross flow of issues between Riverwatch and Landcare as some members of Riverwatch are also members of Shoalhaven Landcare. 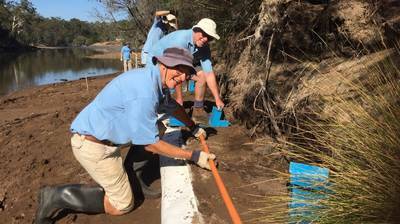 Shoalhaven Landcare has given tremendous support to Riverwatch and over recent years has funded some bank restoration projects. GreenCorp was a Federally funded Government scheme to assist young unemployed people learn on-the-job skills to assist with obtaining full time employment. 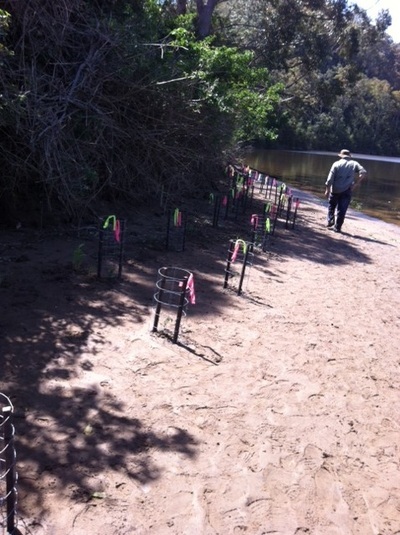 Riverwatch, through the SRCMA, has been given assistance on riverbank restoration by using GreenCorp teams. As well as gaining work experience, young people learn about the importance of protecting our rivers and the associations between river health and fish stocks. 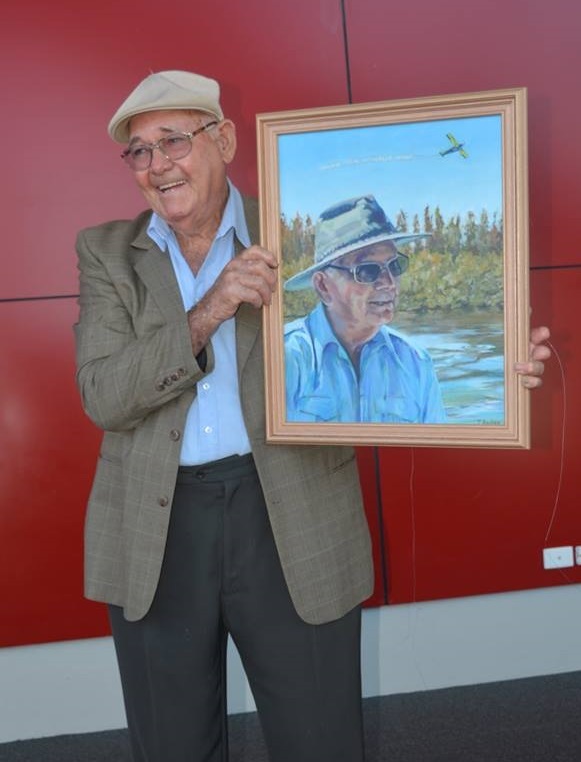 See Lessons from the Mangrove Man for the press story. 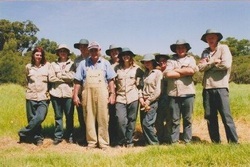 GreenCorp has now been replaced by the Federally funded Green Army. Various Groups undertaking volunteer work or high school studies. 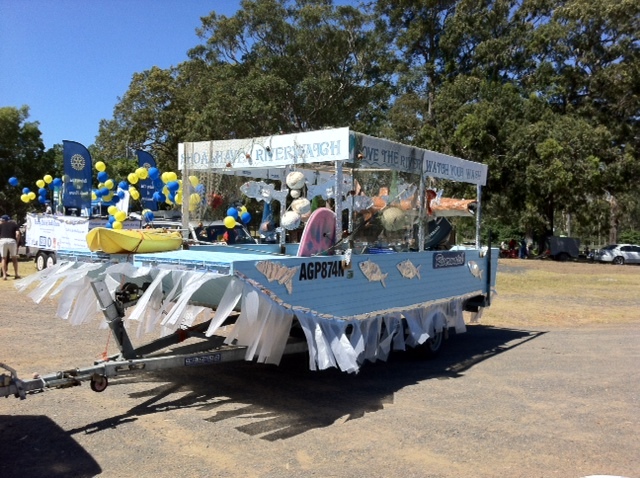 Some photos have links to webpages. Kangaroo Valley is dependent upon the river system for tourism and water supply. 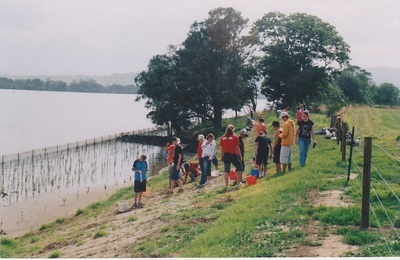 The Valley also suffers from flooding during high rain events. 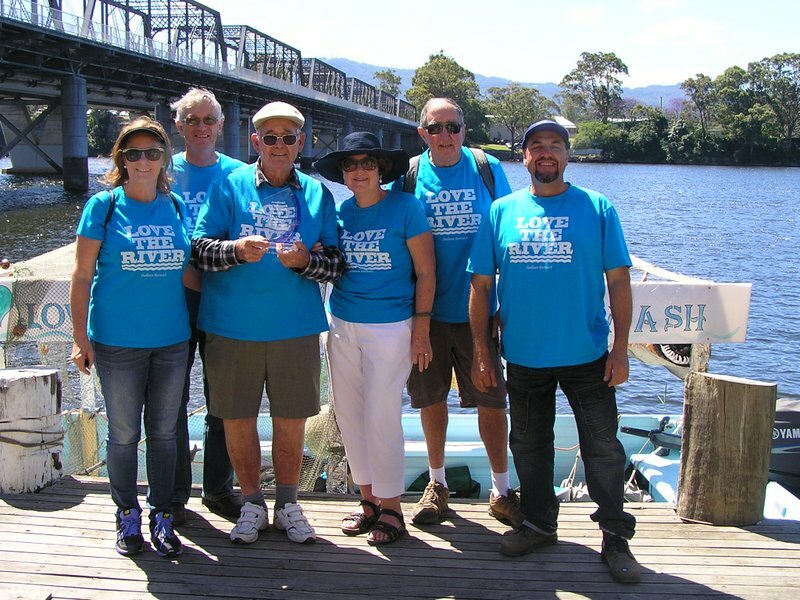 Riverwatch has worked closely with groups in the Valley when Sydney Catchment Authority was pumping excessive water from the Shoalhaven River to Sydney during the drought during 2001-2008. The Kangaroo River, which runs into the Shoalhaven River was drawn down to an unacceptable level. 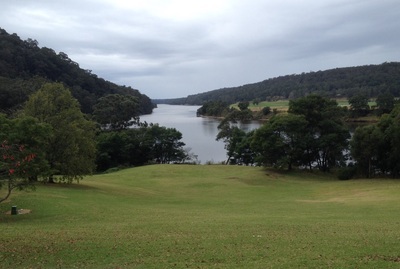 There was also little environmental flows down the Shoalhaven River from Tallawa Dam. Riverwatch was one of the groups that approached the NSW Government to implement a responsible environmental pumping system to Sydney. Click Shoalhaven Transfers for more information on the transfer of water to Sydney and Water Transfers Continue for a 2008 Press article.